ABERDEEN, S.D. 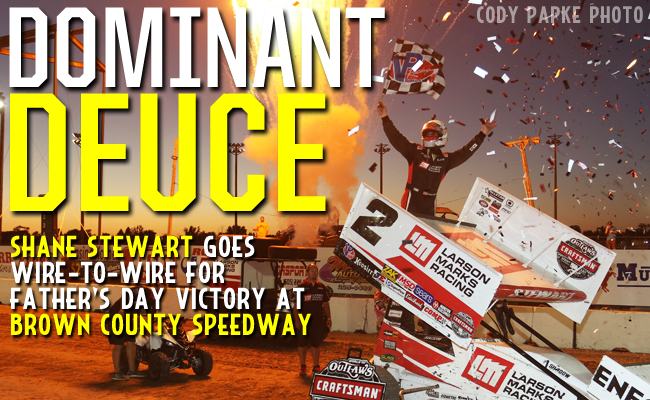 - June 19, 2016 - The World of Outlaws Craftsman® Sprint Car Series returned to Brown County Speedway for the first time since 1985 on Sunday night, as Shane Stewart started on the pole and led wire-to-wire to claim his fifth checkered flag of the season. Stewart, whose wife and young daughter joined him in victory lane, captured the Father's Day victory after he built sizeable lead on Joey Saldana and Donny Schatz while navigating through heavy lapped traffic all night. "[Having my daughter and wife out here] makes it that much more special," Stewart, who now sits third in the championship standings, said. "It's my second Father's Day, so it's cool to have them with me - and happy Father's Day to all the dads out there. "I wish my dad could be here to celebrate with us - but a lot of love is sending back to them. I am very happy we could get the win on Father's Day." To start the night, Jason Sides scored his second quick-time award of the season, while also establishing a new track record at Brown County with a lap of 10.961 seconds. Sides continued to show speed early in the night, as he joined Saldana and Brad Sweet as the three heat race winners. Sides had the speed, but the luck was not on his side, as a dash inversion draw of six placed South Dakota native, Dusty Zomer, on the pole for the six-lap race. Zomer held on to the top spot for just the opening lap, as second-place starter, Stewart, in the American Born Moonshine/Eneos Oil No. 2, muscled his way to the lead. Stewart held on to the lead for the remaining laps of the dash to earn the victory and the pole position for the 35-lap feature. Once the green flag dropped for the feature, Stewart rocketed out to an early lead as Zomer, who started second, quickly fell off the pace, allowing third-place starter, Pittman, to squeeze into second. Zomer's night went further downhill, as he caused the races second caution when he slipped off the track on lap four and came to a stop. The home state driver never recovered, as he finished in the 16th position. Up front, Saldana, who started the race in the fifth position, and Schatz, who started seventh, quickly cracked the top three by lap 10. The two drivers, who have combined to win 13 of the 39 races this year, applied pressure on the leader early. The leaders encountered slower lapped traffic early and often at the tight 1/3-mile, circular-shaped track. Stewart had an easier time slicing his way through the traffic as Saldana, in the Roth Enterprises/HR Livestock No. 83, and Schatz, in the Bad Boy Off Road/Chevrolet Performance No. 15, not only battled lapped cars, but each other as well. As Stewart continued to pad his lead, Saldana and Schatz swapped the runner-up position back-and-forth. Neither driver could capture the position and pull away from the other as the dense traffic played a role in the battle. Finally, in the closing laps, Saldana put some space between him and the seven-time series champion, and set his sights on the leader. Unfortunately for Saldana, Stewart had amassed over a five second lead by that point. In the final 10 laps, Saldana was able to shave a second off of Stewart's lead, but time was not on his side. Stewart was able join Sammy Swindell as the only drivers to win a World of Outlaws race at Brown County, as he dominated all 35 laps to capture the checkered flag. "Track position was just everything, honestly," Stewart added. "We usually have double-file restarts, and it can create a lot of chaos in our races, but having single-file restarts tonight helped me being out front. My guys gave me a great car all night long, and we finally got a dash draw that benefitted us and we were able to take advantage of it. "I just can't thank everyone that is involved with this team enough. We have hit on a little streak here and hopefully we can keep it going all summer. It's a pleasure to come drive this thing day-in and day-out, it's really a dream come true." Saldana was able to score his 10th podium finish of the season and his first since winning at Jacksonville Speedway on May 4. "Wow - for us to be standing here with these guys on the front straightaway, that's like a win," Saldana said. "I can't thank Teresa and Dennis Roth enough for giving me the opportunity; this is a tough, tough series, so when you get knocked down, it's tough to get back up. "The longer the race went, it started to clean off a little bit in turn three and four, so you couldn't move around like you could in one and two...Just a very good effort by the whole team, they worked real hard tonight. Hopefully we can build on this and get better at I-80 Speedway in a few days." Donny Schatz extended his slim point lead on Brad Sweet, as he continued his hot streak in the month of June with his sixth top-three finish in eight races this month. "These guys did an awesome job, we just didn't get around here as quick as we needed to," Schatz said. "Shane [Stewart] was awful good, and we were trying to race with Joey [Saldana] there, but we just weren't quite good enough. "That's the way it goes in racing - some day's you're good, and some days you not. A top three is still pretty respectable, like I said my guys do a remarkable job and we will get another crack at it on Wednesday." Tonight's KSE Hard Charger, David Gravel, advanced eight positions to finish sixth, coming up one spot short of capturing his seventh top-five finish in eight June races. The World of Outlaws Craftsman Sprint Car Series continues their trek through the heartland of the United States, as they head to Greenwood, Neb. for the NAPA Auto Parts Outlaw Showdown at I-80 Speedway on Wednesday night. For more race information and ticket purchasing options, visit: www.WoOSprint.com/I-80-Speedway. RACE NOTES: Shane Stewart captured his fifth win of the season, which is third most of any driver in 2016...Jason Sides scored his second quick-time award of the season and established a new track record at Brown County Speedway...2016 Kevin Gobrecht Rookie of the Year Contender, Clyde Knipp, qualified for his fourth A-Main of the season. CONTINGENCY WINNERS - MSD Ignitions ($25 cash): Casey Mack; MSD Ignitions ($50 cash): Shane Stewart; Penske Shocks ($50 cash): Donny Schatz; JE Pistons ($50 cash): Jason Sides; VP Racing Fuels ($50 cash): Logan Schuchart; Edelbrock ($50 cash): Paul McMahan; Comp Cams ($50 cash): Aaron Reutzel; Morton Buildings ($50 cash): Aaron Reutzel; Cometic Gasket ($50 cash): Jason Johnson; Super Flow ($50 cash): Greg Wilson; Craftsman/Sears ($100 cash): Dusty Zomer; KSE Racing Products ($100 product certificate): David Gravel; Comp Cams ($50 product certificate): Shane Stewart; JE Pistons (Set of Rings): Cory Mack; JE Pistons (Set of Rings): Trent Stengl. SEASON WINNERS: Donny Schatz - 10 (Volusia Speedway Park on Feb. 14, The Dirt Track at Las Vegas on March 4, Stockton Dirt Track on March 18, Stockton Dirt Track on March 19, Silver Dollar Speedway on April 2, Lincoln Speedway on May 19, Weedsport Speedway on May 22, Lincoln Park Speedway on June 8, Knoxville Raceway on June 11, River Cities Speedway on June 17); Brad Sweet - 6(Volusia Speedway Park on Feb. 13, Volusia Speedway Park on Feb. 14, Cotton Bowl Speedway on Feb. 26, Ocean Speedway on April 1, Bakersfield Speedway on April 15, Plymouth Speedway on May 13); Shane Stewart - 5(Arizona Speedway on March 6, Devil's Bowl Speedway on April 23, Lawrenceburg Speedway on May 30, Granite City Speedway on June 15, Brown County Speedway on June 19); Daryn Pittman - 4(Royal Purple Raceway on Feb. 27, Perris Auto Speedway on April 16, USA Raceway on April 18, New Egypt Speedway on May 24); David Gravel - 3(Thunderbowl Raceway on March 12, Tri-State Speedway on May 14, I-96 Speedway on June 6); Joey Saldana - 3(The Dirt Track at Las Vegas on March 3, Devil's Bowl Speedway on April 22, Jacksonville Speedway on May 4); Kerry Madsen - 2(Eldora Speedway on May 6 and 7); Lance Dewease - 1(Williams Grove Speedway on May 20); Chad Kemenah - 1(Fremont Speedway on June 3);Jason Johnson - 1(Placerville Speedway on March 24); Terry McCarl - 1 (Knoxville Raceway on June 10);Jason Sides - 1(I-30 Speedway on April 26); Greg Wilson - 1(The Dirt Track at Charlotte on May 27). World of Outlaws Craftsman® Sprint Car Series Statistical Report; Brown County Speedway; Aberdeen, S.D. ; June 19, 2016.